After 8,000 people attended a Longines FEI Jumping Nation’s Cup USA parade in Downtown Ocala Saturday evening, a huge crowd turned out for the show jumping event the next day. 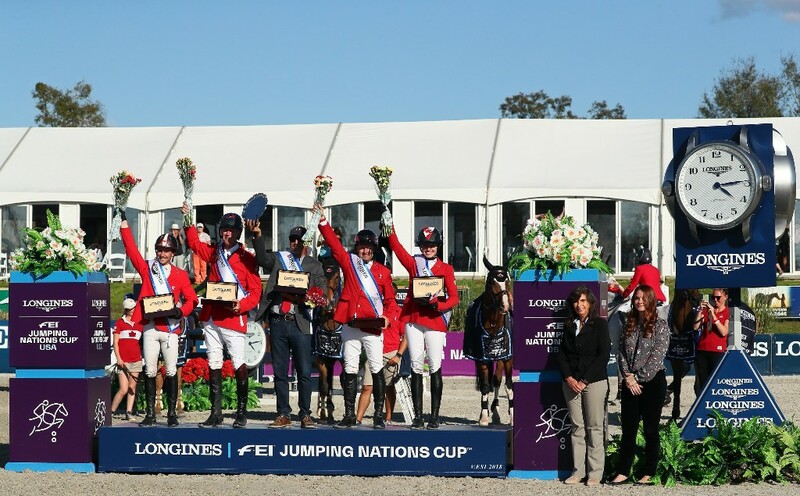 A crowd of nearly 5,000 people gathered in the Ocala Horse Properties Stadium at HITS Post Time Farm in Ocala, Florida this past Sunday to cheer on their country in the Longines FEI Jumping Nations Cup™ USA, the first CSIO5* Nations Cup Qualifier to be held in the USA. Riders from all over the world brought their A-game and their most skilled horses to give their team a chance at qualifying for the Longines FEI Nations Cup™ Finals in Barcelona this coming fall. Francois Lamontagne aboard CHANEL DU CALVAIRE, riding for Team Canada. Six teams entered the competition from Brazil, Germany, Mexico, the USA, Ireland, and Canada. With a field of ten Olympic Veterans, the competition was bound to be tough. Round one started with only a few clear rounds. 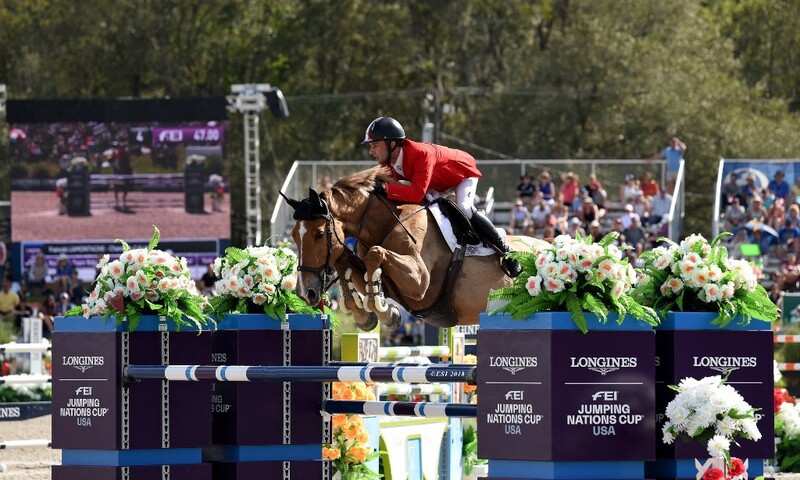 Both Ian Millar and Eric Lamaze went clear for Team Canada, as did Rodrigo Lambre and Yuri Mansur for Team Brazil. Three time $1 Million Grand Prix winner, Andre Thieme, went clear in round one, as well as his teammate Meredith Michaels-Beerbaum, both riding for Germany. Many riders in round one ended up with either four or eight-fault scores. At the end of round one, Canada and Germany were tied for the lead with a total of four-faults each. Brazil was four-faults behind, with an eight-fault total, followed by Ireland, the USA, and Mexico. Hoping to hang onto their lead, Germany had some difficulty in the second round, collecting faults with each ride and one elimination. Meredith Michaels-Beerbaum attempted to catch the team up by turning in a four-fault round aboard DAISY, which unfortunately was not enough to keep Germany in the lead. Ireland, Brazil, and the USA all had one rider go clear in the beginning of round two, which leveled the playing field. Felipe Amaral went clear for Brazil in round two aboard PREMIERE CARTHOES BZ, keeping Brazil in the top three. 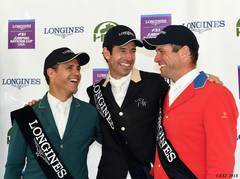 Cian O'Connor and CLENUR went clear for Ireland, giving the 2017 Gold Medalists a chance at winning the Longines FEI Jumping Nations Cup™ USA for the second year in a row. For the USA, Lauren Hough and OHLALA went clear as the crowd waved their American flags. 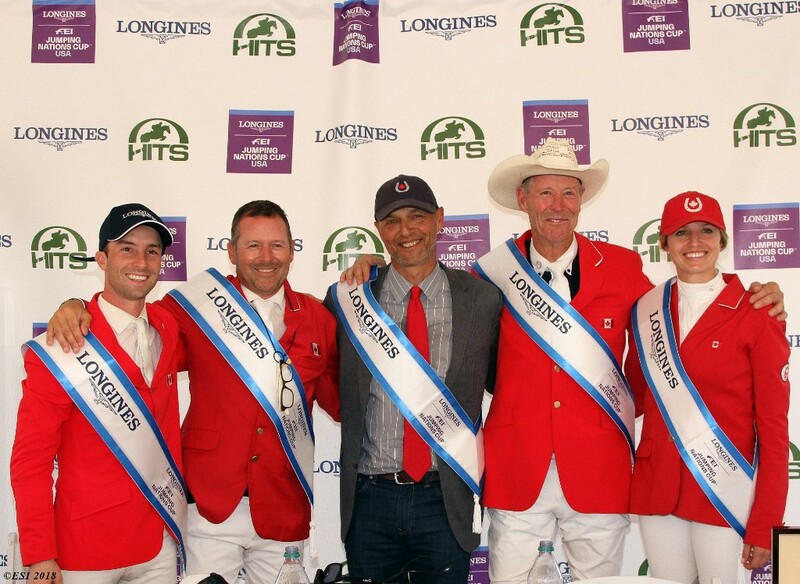 From left to right, Francois Lamontagne, Eric Lamaze, Chef d'Equipe Mark Laskin, Ian Millar, and Tiffany Foster, making up Team Canada. Canada again had two clear rounds. Eric Lamaze aboard COCO BONGO and Ian Millar aboard DIXSON both went clear in the second round, making them the only two riders to go double clear. This proved to be exactly what Canada needed, awarding them the Gold Medal with a two-round total of eight faults. Brazil took the Silver Medal with a two-round total of sixteen faults. Tied for the Bronze Medal, Team Ireland and Team USA both had a two-round total of twenty-four faults. When asked about picking his team, Chef d'Equipe Mark Laskin said "When it comes to the Nations Cup the first people I pick up the phone to call are Captain Canada and Eric Lamaze." Captain Canada, as Ian Millar is fondly known is a ten-time Olympian and has seen his fair share of World Cup and Nations Cup competitions. "I am very much a Nations Cup rider." said Millar when asked about the format of the competition, which along with his skill, allowed him to excel in this competition. Team Canada anchor rider Lamaze is no stranger to international team competition, as he has ridden in WEG and the Olympics several times. "I love the Nations Cup format, I'm a big fan of it" said Lamaze. "I would like to say congratulations to Marina" he said about course designer, Marina Azevedo. "I travel around the world to many FEI5* shows and it's been a long time since I've seen a course that is so well built, fair for the horses, and still getting very few clear rounds". Azevedo is a world renowned course designer, however this was her first time designing for a FEI5* event. "It's very hard to build for a FEI5* star event" said Azevedo. "I would like to have four to eight go clear for an event like Nations Cup, so I was very happy". Team Canada poses with their Longines watches for the winner's photo. "Just as this is Marina's first time course designing for a 5* Nations Cup Class, this is my first time hosting a 5* Nations Cup" said HITS President and CEO Tom Struzzieri. This is the fourth year in a row that HITS has hosted a Nations Cup Qualifier, but is the first time it has been sponsored by Longines as a CSIO5*. "Longines is such a spectacular sponsor. They make it a whole lot easier to put on an event," Struzzieri continued. Check our website for updates at hitsshows.com.